The entire Lake County community is invited to choose between two proposed calendar options for the 2015-2016 school year through an online poll at http://www.lake.k12.fl.us/calendarvote. Parents, students, employees and community residents have until Tuesday, Jan. 13, to select an option. A summary of the options is shown below. • School starts Monday, Aug. 24, 2015. • Five days off around Thanksgiving – Nov. 23-27, 2015. • Spring Break from March 21-25, 2016. • School ends Thursday, June 9, 2016. • Three days off around Thanksgiving – Nov. 25-27, 2015. • School ends Tuesday, June 7, 2016. Visit http://www.lake.k12.fl.us/calendarvote to view each option in detail. The online poll will close on Tuesday, January 13. The results of the poll will be forwarded to the Lake County School Board. The Board is expected to consider the 2015-2016 school calendar options at its meeting on Monday, January 26. 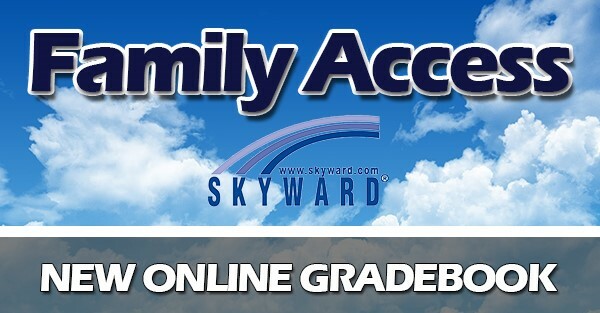 Beginning tonight and through the weekend, the school district’s new online gradebook, Skyward Family Access, will be unavailable as data on the site is updated. Parents and guardians of students who attend Lake County Schools are encouraged to create a Family Access account. Through the Family Access portal, parents and guardians will have the ability to view their child’s grades, attendance and other data. The Family Access portal is replacing the district’s older online gradebook, eSembler. For parents that had an eSembler account last school year, many received an email on Sept. 17 from do.not.reply@lake.k12.fl.us with a link to begin the process of setting up a Family Access account. Step-by-step directions on setting up a Family Access account are available online at http://www.lake.k12.fl.us/familyaccess. For parents and guardians who did not receive an email or did not previously have an eSembler account, they will need to print out a Family Access Enrollment Form. The form is available online at http://www.lake.k12.fl.us/familyaccess. Only one email address per form is permitted. Parents and guardians will have to fill out a separate form for each email address. Fill out the form; have it notarized by a public notary; and return the form to the school. After returning the form, the school will verify the information. Once the parent account is created, the district will send an email with sign-in instructions to the parent automatically. For more information, log on to http://www.lake.k12.fl.us/familyaccess. After a successful pilot at Eustis High School, the Lake County School District is launching its new online gradebook, Skyward Family Access. The Family Access portal is replacing the district’s older online gradebook, eSembler. For parents that had an eSembler account last school year, they will be receiving an email on Wednesday from do.not.reply@lake.k12.fl.us with a link to begin the process of setting up a Family Access account. Parents and guardians will use their current eSembler user ID (email address) as their username for Family Access. Step-by-step directions on setting up a Family Access account are available online at www.lake.k12.fl.us/familyaccess. For parents and guardians who did not receive an email or did not previously have an eSembler account, they will need to print out a Family Access Enrollment Form. The form is available online at www.lake.k12.fl.us/familyaccess. Only one email address per form is permitted. Parents and guardians will have to fill out a separate form for each email address. For more information, log on to www.lake.k12.fl.us/familyaccess. Project SOS (Support Our Soldiers) is at it again with another round of life-changing donations to students at Lake Hills School. 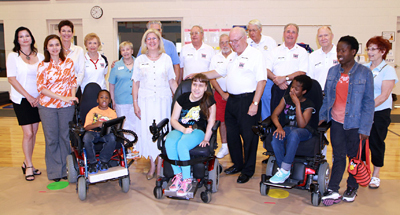 Last year, Project SOS donated motorized wheelchairs to three students at Lake Hills School. Last week, the charity foundation donated motorized wheelchairs to another three students: LaFabian Irvine, Jaymie Gleash and Sophie Joseph. The primary goal of Project SOS Support is to provide services to veterans and their families in times of need. The charity foundation was established in 2009 and supports U.S. military serving overseas, disabled veterans and homeless veterans. Gary Kadow is the Founder and Chairman of Project SOS and is assisted by the Board of Directors which is comprised of top business professionals and military leaders from the tri-county area. Initially, Project SOS provided medical and surgical supplies to U.S. military personnel who were carrying out humanitarian missions in Iraq and Afghanistan. This resulted in the opening of 22 medical clinics and one pediatric hospital to treat the children caught in wartime conditions. All these facilities were operated by U.S. military medical battalions, and thousands of children’s lives were saved as a result of the troops efforts. During the past year Project SOS shifted their effort from overseas due to troop withdrawals and now concentrated on the local area by providing motorized wheelchairs to severally disabled veterans, and also providing clean water, food, clothing, shelter and medical care to our homeless veterans in the Central Florida area. Project SOS has been able to distribute 42 motorized wheelchairs, and numerous mobility devices to local veterans who have served in World War II up to and including those returning from Afghanistan. This is in addition to caring for our homeless veterans and families living in the local Ocala National Forest. To learn more about Project S.O.S, call 352-750-6820, or log on to www.projectsosusa.org. For more information about Lake Hills School, log on to www.lake.k12.fl.us/lhe. 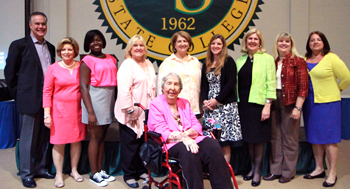 A new venue at Lake-Sumter State College’s Everett A. Kelly Convocation Center gave the Educational Foundation of Lake County’s annual Night of Stars celebration a new vibe this year as dozens of volunteers and school employees were honored last week. Harmony Gray, Beverly Shores Elementary School — As the youth division winner, she volunteered more than 440 hours this school year and has been a volunteer for two years. Some of her volunteer activities include: helping with the summer pre-kindergarten program; school office; and family science nights. Gayle Minnig, Mount Dora High School — As the adult division winner, she has volunteered more than 2,000 hours this year and has been a volunteer for 4 years. Volunteering for the Hurricane Marching Band at Mount Dora High is her passion. Her biggest challenge date was to organize the band’s largest field trip in history: the Super Bowl parade in New Orleans. Martha Koons, Beverly Shores Elementary School — As the senior division winner, she had volunteered more than 2,500 hours this year and has been a volunteer for 10 years. Her patience and dedication has helped hundreds of children learn to read not only at Beverly Shores, but at Eustis Heights and Leesburg elementary schools as well. Nilda Rivera — A Secretary from the Human Resources Department, Rivera has been with the school district for 10 years. She is responsible for fingerprinting and screening employees. Her supervisor finds her to be organized and constantly looking to improve productivity. Lydia Flores — A Secretary for Title I Department, Flores has eight years of experience with the school district. She is known for her passion for working with families who are sometimes left out of the school setting. She has formed relationships within the community to provide food, clothing and household items to families in need. Rivera was selected as the School-Related Employee of the Year. The nominees for the Volunteer of the Year and School Employee of the Year awards were selected by peer vote at their school site or department and a panel of independent judges scored the nominee packets using guidelines from the Florida Department of Education. Both winners will compete at the state level over the summer. The entire Lake County community is invited to select their preference between two proposed calendar options for the 2014-2015 school year through an online poll at http://lake.k12.fl.us/calendarvote. Parents, students, employees, and community members can review the two calendar options online before selecting their preferred option. With both options, the school year for Lake County Schools is slated to begin on Monday, Aug. 18. The first option has school ending on June 4 with more days off around Thanksgiving and the winter holidays with Spring Break from March 30-April 3. The second option has school ending on June 2 with fewer days off around Thanksgiving and the winter holidays and Spring Break is on March 23-27. To select an option and review each calendar option, log on to http://lake.k12.fl.us/calendarvote. The online poll will close on Monday, April 14. The results of the online poll will be forwarded to the Lake County School Board. The Board is expected to consider the school calendar option at its meeting on Monday, April 28. This year’s school calendar has been delayed as school districts rely on the Florida Department of Education (FLDOE) to set testing dates, which for the purpose of a school calendar are used to ensure that spring break schedules do not interfere with statewide testing schedules. The 2014-15 school year is when testing in Florida will transition from the FCAT 2.0 and end-of-course exams to an assessment that measures high quality curriculum standards. The Florida Department of Education is in the process of making plans for these new tests and has not released the 2014-2015 testing schedule. Although FLDOE has not released a testing schedule, the Lake County School District is moving forward with the calendar approval process. It is important to remember that when the testing calendar is released from the state, the school calendar for next year may need to be adjusted to accommodate the predetermined testing dates. Laura Fagan, an eighth grade social studies teacher from Windy Hill Middle School, took the title of 2015 Rookie Teacher of the Year for Lake County Schools at last month’s Award Ceremony at Lake-Sumter State College. The two other finalists for the annual award were Cynthia Murray, a kindergarten teacher at Eustis Heights Elementary, and Lindsey Massaro, a band teacher at Umatilla Middle. 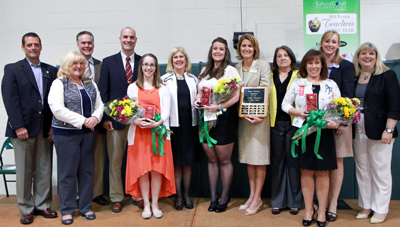 The Rookie Teachers of the Year Celebration was hosted by the Educational Foundation of Lake County and presented by Ernie Morris Enterprises and HON. The finalists were selected based upon a panel of judges’ review of their application. To be eligible for the award, teachers must have three years of experience or less. The final selection was announced after another panel of judges conducted on-site interviews and observed the three finalists in the classroom.